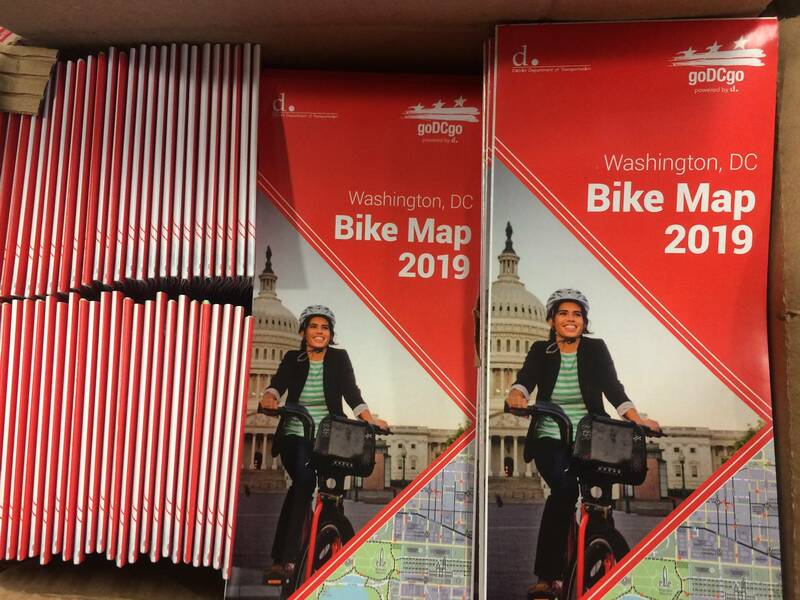 It is illegal to bike on the sidewalk anywhere in DC’s Central Business District, which is bounded by 2nd Street NE/SE on the east, D Street SE/SW on the south, Massachusetts Avenue NW/NE on the north, and 23rd Street NW, Constitution Avenue NW, and 14th Street SW/SE on the west. Outside of that area, riders may choose to use sidewalks, streets, or bike lanes where they are available. When riding on the sidewalk, please remember that it is a cyclist’s responsibility to yield to pedestrians. Regardless of where in DC you’re biking, helmets are required for all cyclists 16 and younger, and are recommended for cyclists of all ages. Where it is legal, many cyclists choose to ride on the sidewalk for their own safety. When doing so, please remember that bicycles are faster and heavier than pedestrians, and pedestrians may not always be aware of your presence, particularly if you are approaching from behind. When approaching a pedestrian from the side or from behind, please remember to ring your bell and call out to make them aware of you and where you plan to go: phrases like “on your left” or “on your right” are often useful here. To ensure that you are giving your full attention to the road users around you, please be sure to not use your cell phone while riding. Drivers are required by law to yield to cyclists both on roads and in crosswalks. 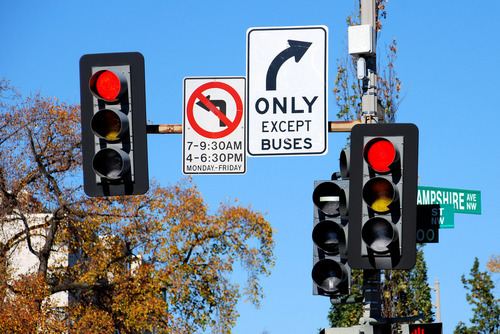 That said, cars may not often see a cyclist crossing the street in a crosswalk, particularly if they are expecting to only see slower-moving pedestrians. Use caution while crossing any automobile right-of-way, including curb cuts, driveways, and garage entrances. Be careful as well for drivers and passengers in parked cars opening doors, regardless of whether one is biking on the sidewalk or the street. Stay out of the “door zone” whenever possible. We all want to get where we’re going safely and as quickly as possible. While cycling is a great way to do that, sometimes it’s not possible to do so in a way that ensures the safety of all road users. If you encounter a crowded sidewalk, and do not feel comfortable biking in the road, it’s in everyone’s best interests for cyclists to dismount and walk until you get to an area that is safer for biking. At the end of your trip, please be sure to leave your bike in a location that does not interfere with other road users. If you’re on a Capital Bikeshare bike, this is simple: just place the bike into any open dock, and wait until you see the green light. If you’re riding one of the many dockless bikeshare options available in DC, please be sure to place the bike away from the flow of pedestrian and automobile traffic, and please also be sure not to block any doors, driveways, or fire hydrants. Please also leave it in a location where the next rider can easily access it. If you are riding your personal bike, you may lock it to any public bike rack, or you may lock it to some stanchions, including many parking meter poles and traffic sign poles. Keeping these rules and guidelines in mind while you ride will help everyone get to their destination as comfortably, quickly, and safely as possible. 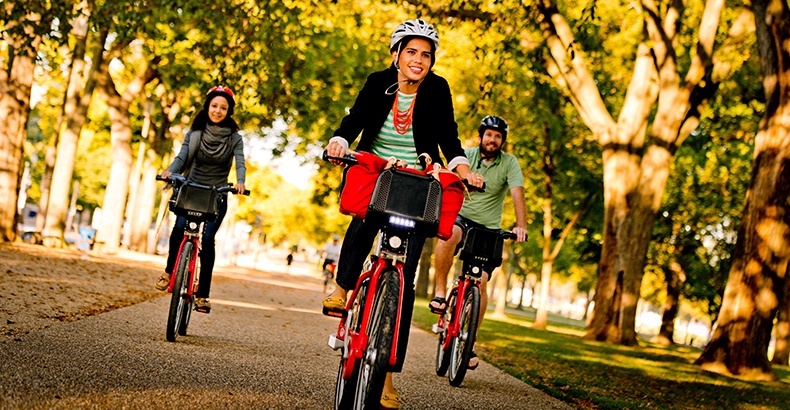 Courtesy goes a long way in making DC an even better place to bike!